Back in the 60s, novelists hired personal assistants to type and retype chapter drafts for their books, dozens of times over. When a technician at IBM heard about it in 1968, he decided to see if the word processor he'd been working on might help. A few weeks later, Deighton stood outside his Georgian terrace home and watched as workers removed a window so that a 200-pound unit could be hoisted inside with a crane. 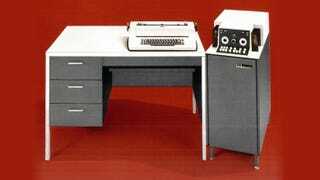 The machine was IBM's MTST (Magnetic Tape Selectric Typewriter), sold in the European market as the MT72. "Standing in the leafy square in which I lived, watching all this activity, I had a moment of doubt," the author, now 84, told me in a recent email. "I was beginning to think that I had chosen a rather unusual way to write books." "One might almost think the word processor (as it was eventually named) was built to my requirements," Deighton told me: "I am a slow worker so that each book takes well over a year-some took several years-and I had always 'constructed' my books rather than written them. Until the IBM machine arrived I used scissors and paste (actually Copydex one of those milk glues) to add paras, dump pages and rearrange sections of material. Having been trained as an illustrator I saw no reason to work from start to finish. I reasoned that a painting is not started in the top left hand corner and finished in the bottom right corner: why should a book be put together in a straight line?"